First there was one Kabobgy, then another and finally a third. Arguably there is no other Middle Eastern restaurant in Windsor-Essex with quite the distinctive branding of Kabobgy, making it seem like a local, regional or national chain. Nope, just local, and there are plans for more. Kabobgy is owned by three brothers, originally from Syria. The first resto opened 10 years ago and now is at Manning and Tecumseh roads. In 2013 the second at Lauzon and Tecumseh opened. It’s more of a fast food place with 15-20 chairs. Finally, in 2015, the Malden Rd. LaSalle site opened, with 60 seats. Three outlets, run by the three Hadad brothers. Wadi Hadad runs LaSalle, Nabil Lauzon and Tecumseh, and Nazih Manning and Tecumseh. Wadi isn’t sure if theirs is the biggest local ME chain but “probably” is. The distinct multicolored logo showing a skewed kabob was designed by the brothers, handed off to a designer. It’s strong and attention-getting. Wadi says a fourth location in Amherstburg six months ago fell through when they lost the site; the brothers will continue looking in the Burg and elsewhere. “We have plans but, you know, it takes time. It’s a family business and the whole family takes care of it and we don’t want to lose the quality, so we don’t want to go fast.” What does kabobgy mean? “Kabobgy is the guy who makes the kabobs.” Of course! A recent lunch in LaSalle, the spacious location in a strip plaza, was clean, airy with tan and brown motif. The Beef and Lamb Shish Kafta lunch plate was served with hummus and fattoush salad. The serving, on a square plate, was a decent size accompanied by one slightly warmed plastic wrapped pita pouch. The garlic sauce had a nice tangy zing. The highlight was the fattoush. Fattoush in most restaurants is served fresh enough but ingredients tend to be sliced large with unwelcome matter like lettuce spines. Here it was diced small, plenty of it, therefore eminently eatable. There were only two kafta logs and, though good, the lamb seemed indistinguishable from the beef; some spiciness would also have helped. The restaurant serves a few gluten-free dishes and is licensed. From order to serving took 13 minutes. Price before tax (no beverage or dessert): $12.99. Usually WON.com doesn’t review Detroit restaurants. But our interest was piqued by all the new development downtown as well as in the burgeoning Midtown district, just north of the central business core. 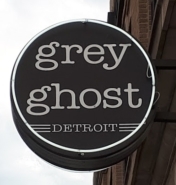 In fact our travels took us to Grey Ghost Detroit (47 Watson St., 313-262-6534; www.greyghostdetroit.com), located almost immediately across Woodward Ave. from Little Caesars Arena. Grey Ghost has been stacking up some impressive reviews and we expected, for something of a chi chi location – one our party more accurately described it as “shabby chic” – to pay a little more. But we were floored by the prices - $55 for Filet Magnon, $47 for Dry Aged New York Strip, with most glasses of wine around $15, and a couple, the Pinot Grigio and Sauvignon Blanc, weren’t very good. Moreover, the menu was meagre. Three “cured” and three “raw” appetizers. About half a dozen main courses. The menu itself was a pad where you lifted the cover flap - okay! Two parties around us took a look at it and presumably seeing the prices got up and left. Other tables nearby were ordering the cheapest items – Chicken Wings ($18) which looked delicious, or Cheeseburgers ($13) which was our choice, poor plebs that we are. Sides of Fries ($4) were a bowl of thin – and plentiful – fries that looked salty but weren’t. You can always tell a gourmet restaurant because they serve hamburgers with steak knives stuck in the top. Such was here. These double-burgers, however, were rather tasteless. But the appetizer of Fried Bologna (waffle, sharp cheddar, jalapeno) ($10) was superb – smoked with a sweet sauce and sublimely delicious - who knew bologna could be served so gourmet? Our waitress exhibited predictably over the top pretentiousness and her “niceness” seemed more scripted than real. But on a perfect Saturday mid-summer evening the resto was packed, as were a couple of others around the block. Good to see these new eateries are attracting diners to a once vast no-man’s-land near downtown. The atmosphere felt like Chicago or New York. And just like those cities have their pretentious premises, so too does this gentrified corner of Detroit. Devonshire Mall’s new food court is apiece with its new southern entrance with expansive sidewalks, a vehicle turnaround drop-off, and entrance to the new expanded Shoppers Drug Mart, though vehicle movement is still as congested as ever. There was a lot of extra space in the former Target store, and even further back in time, Zellers – so much that mall management has carved out the newish metro grocery store and now, Shoppers and the airy high-ceiling food court, offering more cuisine selections, more elbow room and new expanded restrooms, all more than welcome of course, especially the restrooms. Meanwhile, demolition work has commenced on the old food court, where new retail will be inserted. These are all part of the mall’s $70 million redo, which started as far back as August 2016. The first part of the regular mall work completed is just off the food court itself. 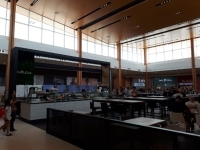 Fifteen restaurants are scheduled for the food court and not all open yet (the food court opening was last week). Besides the airiness, the overall effect of the court is whiteness with natural light flowing in through large windows underneath a slanted roof, which can be seen from afar as you come down the EC Row Expressway ramp! There are several types of tables and chair configurations, including lower four seat tables, higher tables with bolted seatback stools as well as banquettes. Also different from the old court is a couple of restaurant islands, featuring eateries like Cultures and Freshly Squeezed. Koryo Korean Barbceue has yet to open. But you’ll find the likes of KFC, Taco Bell, Tim Hortons (with the biggest customer lineup, ‘natch), Mucho Burrito, Feta & Olives, Hurry Curry, A & W, and Niko Sushi. Hurry Curry looks like it will be a hit if only because there are so few fast food Indian places, especially in malls. Brampton-based Mandarin Restaurant for some reason has been lumped into the food court by mall management but it’s a separate restaurant located on the mall perimeter next to Chapters in the former Stitches space. It remains closed with signs indicating it will open soon. It’s an apparently popular chain though there are other Asian buffets in the Windsor area, so what’s this place got that the others don't? Many shoppers on Canada Day were stopping by only to find the doors closed. No restaurants in Windsor and Essex County made this spring’s 100 Best Restaurants in Canada list. In fact, none even came close. In all of the 519-area code only one lucky resto made the list, prepared by industry website Restaurants Canada, a national, not for profit organization representing more than 30,000 food service professionals. Last week we checked out a few restaurants featured in the Windsor International Film Festival Hospitality Guide. These were among 17 restos which gave 10 per cent off meals to festival-goers during the city’s 13th annual fest…..First up was Downtown Pizza Co., the just-opened and reminted long-time Chanoso’s at 255 Ouellette Ave. Much of the ambience remains the same, such as the red brick wall and furniture. The real changes are in the menu. Whereas Chanoso’s served fusion, the reincarnated space, as per name, is pizza. Not traditional Windsor pizza but artisan pizza, which is fine, with the menu divided between those with red sauce and those with white. (There are also salads and sandwiches known as “in between Bread.”) We all ordered the individual 12 inch white Rosemary’s Baby, full of arugula on top, which looked too much but were told by someone that that’s how pizza is served in Italy – well, okay, what do we know? It was generally good if a bit salty. The local draft beer selection was sufficient…..Next up was Bread Meats Bread, 33 Chatham St. E., another cutesy name for a sandwich haunt. This hole in the wall – actually a long indoor alley of a place – space, is intimate and has a cool, bohemian vibe with its exposed foundation walls and original art. Our gear-designed (very Windsor) table base, however, was dangerously wobbly. The menu has four sandwiches, four small plates (incl Baby Kale and Marinated Octopus), seasonal soup, and apparently changing desserts, and the restaurant is licenced. The Steel Curtain sandwich with slowed roasted beef, pickled mustard, mushroom and Swiss cheese, on a six-inch Ciabatta bun, at $9, was tasty enough…..On to The City Grill, 375 Ouellette Ave., considered one of downtown’s premier eating spots. Its award inning wine list didn’t feature any local red wines and only three whites from two wineries. Partly due to appetite and price, we ordered small plates – Duck Ravioli ($17) and Scallops ($16). The scallops came on a bed of maple cream-flavored risotto-type orzo and a bit of grilled chorizo. The ravioli was stuffed with duck confit, parmesan cream and “micro greens.” Both dishes were quite tasty. But, really, only three ravioli, and nothing else, on the second plate? Burgers and burgers and burgers. Are burgers taking over the restaurant world? Sometimes it seems so. One of the latest burger joints to open is Burger Farm in downtown Windsor (21 Chatham St. E., 519-962-8444; www.burgerfarm.ca). It replaces Tune-Ups, which was also partly a burger joint. Down the street at 33 Chatham E. is co-owner David Prantera’s companion resto, Bread Meats Bread, located in the former Iguana Sushi Bar. Burger Farm's decor – with its clean lines and metallic tables and chairs and a black and lime green colour scheme - is the same as Tune-Ups, the menu obviously altered. The name is a cute idea, a play on down-on-the-farm. The burgers have names like Farm Burger, John Deere, Plow Burger, Pitch Fork Burger. There is the resto's take on hot dogs with a Junkyard Dawg and Dat’ Dawg on brioche with “farm sauce.” There are de rigueur hand cut fries. And despite the meat-centric menu there’s a couple of salads including one with kale (with parmesan, cranberries, pine nuts)! If anything, the restaurant has made a name for itself with Custard Churned Shakes. Custard is not a flavour you see much in Canada. And of course, the resto has the trendy and delicious peanut butter and slated caramel shake versions. Our table service that day was prompt though we would have appreciated a glass of water without having to ask for it. There are three local craft beers on tap and the Brew Lager was perfectly mid-bodied. The John Deere burger plate came with a steak knife stuck into the top of the burger, which was on the small side. The caramelized onions made the dish. There was a plentiful enough supply of fries, which were reasonably tasting. Total price pre-tax and tip: $18.50. The restaurant is intimate and there are three – count ‘em, three - TV screens. The restaurant's arguably most outstanding feature is its street sign, an amazing retro creation without parallel in the city. The combination of not just healthy but tasty food is the sine qua non of Earth Eatery, which this year sprouted up with two locations, one on the east side and the other downtown. Earth Eatery first opened in January at the Tecumseh Business Centre next door to Trios College. And then in the spring it opened at 337 Ouellette. (519-944-1444; www.EarthEatery.ca). Owner Bharathdasan Siva’s philosophy for eating, as in life, is one world - one people. A sign in the restaurant explains it all, welcoming “all sizes, all colours, all ages, all genders,” etc. As far as Siva is concerned it doesn’t matter who you are, just so long as you like to eat healthy. But, he emphasizes, eating heathy doesn’t have to taste bad. Otherwise, “you go back to the greasy food.” But beyond organic and locavore Siva kicks it up a notch with his original “detoxifying” blended juices, starting with one like Morning Boost (grapefruit, lemon, orange and red apple) ($6.84) to regimens for one to five day “cleanses” starting at $34 and running to $225.00. His breakfasts are unique: Chia and hemp pancakes ($12.84) to Wonderful Waffles (banana, peach, kiwi, strawberry and blueberry with organic syrup or honey) and Organic Spinach and Cheese omelet. There are four sandwiches served on whole grain or ciabatta, two types of soups (the kale and lentil looks especially good), and bowls, especially the big-selling Nourishing Quinoa Bowl with beets, broccoli, sweet potatoes, avocado, quinoa, chickpeas and hummus. “Thats the top seller,” Siva says. “So far 1800 likes from facebook for that bowl.” To round things off there are hummus platters. For dessert there are four types of what we’re sure are healthy cheese cakes as well as Energy Bites with various seeds, chocolate chips and shredded sweetened coconut. Our choice of the Honey-Lime Chicken sandwich had a zippy taste to the sauce and came with a Caesar salad by the side. Eastern Flavours (4072 Walker Rd., 519-972-7272; www.easternflavours.ca) might be unique in Windsor for offering a combination South Asian and Middle Eastern menu. And it makes sense, the city having a large Arab-Canadian population with a general population that has long been acclimatized to Middle Eastern cuisine. South Asian – and in particular, Pakistani food – may be a less familiar quantity. It’s less spicy than its Indian counterpart though dishes are similar. Eastern Flavours, located in South Windsor’s big box retail district, took over from the former Sarai a year and a half ago, and is in the same building as Stir Crazy Grille. It has a downstairs level and an elegant mezzanine and seats 175. The resto’s design is interesting, with multiple contemporary large cylinder-shaped red and black lampshades hanging from the ceiling. Server Taha Khan was generous and brought two sample dishes, a first in WON.com's experience. (And, no, he didn’t know a review was being written.) His uncle, Zafar Iqbal, owns the restaurant. Eastern Flavour's appetizers run from samosas to kibbi to Dahi Baya (lentil batter mixed with spices, deep fried in flavoured yogurt). There are soups and salads. And the Desi (North American) menu consists of Biryani, Nihari (stew), Haleem (slow cooked meat, wheat, barley, and lentils). Our dish was Malai Kofta Handi ($12.99) a Mughlai (traditional) plate of spicy chicken balls and coriander leaves – served with rice - providing a complex taste and covered with sumptuous cream, butter and yogurt sauce. The menu has several curry dishes as well as barbecue and grilled meats. Vegetarian isn’t forgotten with seven dishes. Khan says the restaurant will book banquets, including weddings, and there's takeout. Breakfasts have long been served and effective Aug. 13 Eastern Flavours will begin serving a combination Eastern and Canadian brunch. The restaurant isn’t licensed but, among beverages, serves a mean Mango Lassi, made with mango pulp, cream, milk, sugar and ice. Taka Japanese & Thai (5011 Legacy Park Dr., 519-972-3222; www.takajnt.com) took over after the former Montana’s closed, across the parking lot from Silver City cinemas. It serves a combination of Japanese and Thai food, an interesting combo for such a large space. Yet on a Thursday evening the place was doing fairly brisk business. Some of the Western-style decor, including lots of veneered logs and a wagon wheel chandelier, are still in place. Otherwise there are Japanese dolls and masks garnishing the walls. The banquettes and chairs are high backed in a rich dark brown. There’s plenty of space to move around, unlike most restaurants. An open sushi kitchen is on one side, a closed (Thai) kitchen on the other. And it’s well staffed. In our case, we had a tag team of two waitresses, one friendly and one curt and standoffish. Problem, the friendly one was inexperienced and kept asking the curt one for info, which was short in coming. We plowed on. Yes, like virtually every other Westerner in the world we’d like to have ordered Pad Thai. But let’s play different. Instead we ordered a thick noodle version, Beef Yaki Udon. It was served quickly (under five minutes), piping hot and a decent size. But there were too many noodles, they were oily, and only a modicum of vegetables (a few thin carrot and green onion stems). The beef unfortunately was of the flat elastic kind, though there was enough of it. The price was right: $9.95. The restaurant’s Japanese menu dominates with a voluminous selection of Maki and Temaki, Sushi and Sashimi. There’s also appetizers, soup and Teriyaki. There’s an All You Can Taste menu for $22.99 ($14.99 lunch). Ordering is from IPads. There is no licence and the restaurant touts its fruit beverages. Taka also offers take-out and catering, and huge party trays, a nice alternative to pizza and wings for the gang. The Windsor Club (Wiser's Reception Centre 2072 Riverside Drive East, 519-258-1465; www.windsor-club.com) the city’s home for the elite – or those who can afford the membership ($500 plus $150 monthly not including meals) - has been in its new riverfront digs for a year and a half. The place, physically, has to be one of the finest dining venues in the city – spacious, airy, bright, and with renovations, a mixture of old and new. The reconfigured and updated bar is a combination of 50’s retro and contemporary design, there are Edison light bulbs hanging from the ceiling, and there are a couple of massive chandelier lamps at each corner, found from a former church in Detroit. That’s not to mention the expansive patio that sweeps around the perimiter, great for taking in views of Detroit and passing freighters. Come to think of it, this is one of the few spots in the city where people can actually dine on the river – the otherwise lack thereof being a long time complaint by locals though partly solved by The Bistro At The River and of course long time Lilly Kazzilly’s. For lunch, though, the place was a veritable tomb. This was on a bright sunny Wednesday. There was hardly anybody there. Our table was the only one occupied. There were a couple of business types at the bar. And eventually one outdoor table filled. Which begs the question, why isn’t this great space being used? The surroundings, as mentioned, are great. But there were crumbs on the white linen table cloth. And the service, so typical of Windsor (yet we have a college restaurant hospitality program), was underwhelming. The lunch menu was decent enough, with several attractive salads, interesting appetizers including Charcuterie, sandwiches including a No Bun Burger. The main menu paid heed to a variety of diets, from Vegan Pasta to Bishop’s Omelette (Seasonal Greens, Gruyère, Fresh Fruit Parfait, Toast) and Confit Duck leg with Ho Fun Noodles and assorted veggies. Our order, the Atlantic Salmon ($24) came with a creamy lemon risotto (not the Radicchio and Pickled Mushroom Slaw, Mushroom Butter as advertised on the website). The fillet was a decent size and the risotto tasty enough, but not write-home-about, as one might expect from a quality venue. Nevertheless, if you can afford it, this is a nice space and the food is decent enough; the wonder is why more people – elite or not - aren’t using it. Banja Luka Restaurant & Lounge (1214 Drouillard Rd., 519-962-6657) is a restaurant that time forgot. It has been a fixture in Ford City for years with a cavernous ground floor more suited to banquet hall than an eatery open for breakfast, lunch and dinner. On a mid-afternoon it was dark with not a diner in sight. Then a greeting comes from the back. That’s Zarko Pandza, long-time owner. He’s there with one or two friends who use the nearby living room to hang out. Yes, the restaurant is open and he presents a full menu, . The full of Eastern European – formerly Yugoslavian – dishes. But, Pandza says, he’s virtually given up the restaurant biz. Sure, he and his fiancé will turn on the stove to serve a wayward diner. But he only keeps it going because he owns the building, and makes revenue renting rooms upstairs. Pandza, a large, friendly, talkative man, gives you an arm’s length set of reasons it doesn’t pay to be in business - the perils of serving alcohol to inebriated guests, relative high costs of wait staff, the costs (not least, visa and travel) of bringing in ethnic entertainers who could generate a crowd. One man comes in and stands at the long bar and orders a 60-lb. roast pig for a party. Pandza will roast as requested. Meanwhile, he explains some of the delicacies on the menu. There’s Cevapcici, small grilled spicy sausages; Raznjici, the Balkan version of souvlaki; Mesano Meso, a combo platter of grilled meats; Becka Snicla, breaded veal or pork cutlet stuffed with clotted cream. There’s also, well, T-bone steak. For salads, try the Srpska or Serbian which is heavy on cukes, red onions, parsley and tomatoes. Or the Zalena (Bulgarian) with strips of lettuce, radishes and bits of cucumber and onion. Our choice: Cevapcici ($12) which came with a heap of diced raw onion, vinegary cole slaw, sturdy white European bread. The sausages were delicious. It’s s shame this Balkan cuisine is so neglected. We have found our favourite place for “comfort food” mac and cheese! We thought the ultimate had been found (though we weren’t all that impressed) at Clarkston Michigan’s much touted Union Workshop’s version of the dish, so featured on Food Network’s Diners. But it hasn’t got anything on the same dish at Windsor’s The Bourbon Tap and Grill (1199 Ottawa St., 519-255-1199; www.bourbonwindsor.com). But first a little about what used to be the Italian Per Bacco Ristorante, now converted into a wide-open bar, with handsome patio, and uniquely featuring 53 – count ‘em, 53 - different bourbons. Now into its third year The Bourbon, with live music evenings, has brought more needed night life to Ottawa Street. The restaurant-bar is airy with lots of touches of dark wood as befits a place where the major drink is one that comes from casks. Indeed, there are cask motifs and a giant semi-circular sculpture above the floor by the bar made out of cask planks. And of course, there are the obligatory New Orleans Bourbon Street touches, like a street sign and painting. More notable are the giant black and white photos of the 1930s Prohibition era, one showing people carrying “We Want Beer” picket signs. The spacious patio also has stylish outdoor furniture including a comfortable corner sofa. Pizzas, courtesy of a wood burning oven, seem to be the food here – there are 13 available. Burgers also, such as, of course, the Bourbon Burger, which includes the house Bourbon BBQ sauce. Speaking of that sauce – and getting back to our mac and cheese dish, this was listed as an appetizer at $11.99. But it was really a dinner, served in an elongated boat piping hot from the oven. The dish has enough to fill a very hungry stomach. But what seems unique is the macaroni infused with pulled pork. And there is the dreamy sweet Bourbon BBQ sauce. Whether you drink bourbon or not, The Bourbon is worth a visit just for this dish alone, and we’ll be making a point of coming back for more. Yami Noodle & Rice (1459 Ottawa St., 519-915-6341; on facebook) is a welcome addition to Ottawa Street. Since 2015 the restaurant, owned by Eric Kim, has been serving up Korean food and sushi. But that changed last December when the menu was overhauled and pretty much all the food, except for just a few sushi dishes, is now Korean. Korean cuisine is still new to Windsor so it’s not surprising that many of Yami’s customers are uninitiated to its fine art. First, Korean meals differ from Chinese in that there is much less oil used. Server Ji Hyun calls the food “very healthy. We use a lot of broth and veggies and fermented vegetables.” Virtually every dish comes with veggies. Rice is also a big player. And there are the subtle flavours like the restaurant’s home made teriyaki sauce. The menu is broken into starters like miso soup, creamy yam soup and crab spring rolls, gyoza (dumplings) pan fried or steamed, and home made kimchi (fermented cabbage). The main dishes are hardy and stick-to-the-ribs kind of food, such as the Topokki - spicy stick rice cake with Korean chili sauce and fish cake. Soups abound, defined by the ubiquitous wheat floor noodle, Udon. They come with pork, chicken, pan fried beef, shrimp and vegetable tempura. Our meal was one of the restaurant’s most popular, New Donkatsu ($10.95), featuring deep fried pork over hot vegetables with teriyaki sauce. It was served piping hot on an oval skillet, itself set on a matching oval wood tray. The dish had a dozen equally sliced pieces of pork in a golden crust, cooked just right, on a bed of sticky rice and vegetables. At the end of a busy work day the meal proved perfectly filling. Another popular dish is the, yes, Korean hamburger! It’s called a Bulgogi Burger, bulgogi meaning a combination of thinly-sliced marinated meats. The meat and mozzarella - with veggies of course – overflows the Kaiser bun. Served with fries and pop the meal comes to $12.95. Ji Hyun said some diners are not used to the Kimchi, a Korean side dish staple. But many will probably come around, the more they’re exposed to this great Asian food choice. The restaurant, by the way, has an airy interior, with beige and brown accents, and is licenced, serving Asian beers hot sake. For the uninitiated, Tommy’s Bar-B-Q (999 Erie St. E, 519-254-1111; www.tommysbarbq.com) is the reincarnation, by a different generation, of the old Tunnel Bar B-Q downtown on Park St. opposite the Detroit-Windsor tunnel, which closed in 2014. That restaurant, of course, for decades, was one of the city’s signature eating places, and attracted a good number of locals as well as tourists from Detroit. Its delicious slide-off-the-bone ribs were classic. And its cakes and pies renown. Tommy's tries to recreate that atmosphere. The restaurant’s decor is great, with dark tones, wooden tables and booths, a compact attractive bar, and throwback motifs to the original Tunnel Bar B-Q, including framed pictures of Tunnel founders Harry and Helen Racovitis. The wait staff was friendly and accommodating. We asked for a half-strip of ribs, presented cut so as easier to eat. Served with the famed crinkle cut fries, coleslaw and a bun, the order, price-wise, came out to $17.95. The pork was juicy enough, but fatty and chewy. Two chefs who worked at the original Tunnel are now employed here and the restaurant uses some of the original Tunnel kitchen equipment, so it was hard to figure out why the ribs weren't quite as tender as how we remembered. Meanwhile, the generous portion of fries? Unfortunately, bland. Ditto for the smallish bread roll. There were three meat sauces on the table – hot (the original), molasses, and sweet - all were good depending on your pleasure. As for the restaurant menu in general, Tommy's focuses heavily on ribs and chicken but also offers fish and chips, shrimp, poutine, and even pulled pork bruschetta. And the glass display case full of dessert cakes (we didn’t try any), made right there on the premises, looked as delicious and delightful as at the original Tunnel. Mazal Tov Kosher Cuisine restaurant (1653 Ouellette Ave., 519-252-0221; www.mazaltovkoshercuisine.com) has been in existence almost 20 years. On our visit on a mid-week night the large airy restaurant, its tables set with linen, had one group of seniors dining together, two 70-something couples at another table, a young couple of a third, and a construction worker stopping by for take-out brisket. Most of the diners were not Jewish which is often indicative of the clientele, says the owner, Mazal. (The restaurant is a play on her name.) Mazal Tov has an extensive middle-of-the-road, though not bland, menu. You’ll find something to please most tastes. The dinner menu has several varieties of chicken from Teriyaki to Stir Fry. There’s also Sweet & Sour Meatballs, Rib Steak, Grilled Salmon, Veggie Pasta, even a Veggie Burger. All meals are served with rice or potatoes and sautéed vegetables. Appetizers veer towards the Mediterranean with a same-name salad, Borekas (llightly layered dough filled with spinach and potatoes), Hummus and Bruschetta. There's also Egg Rolls and Garlic Bread. Desserts are cakes, Baklava and a daily special. For beverages, there are several choices of fruit juice. The restaurant isn't licensed. Our order was cabbage rolls served with roasted potatoes and vegetables. The cabbage rolls were huge and covered with a sweet, almost barbecue-tasting, tomato sauce. The serving was plentiful but bread would have been nice to sop things up. The meal, without dessert or drink - just water - came to $15.95. Mazal prepares many of the meals herself along with a kitchen staff, dining there is almost like dining in her house. The restaurant does not take credit or debit cards. “I take cheque, cash or next time,” Mazal says. One of Olde Walkerville’s mainstays, and one of its largest restaurants, keeps serving up “twists” on your favourite comfort food. That’s why it’s called The Twisted Apron (1833 Wyandotte St. E., 519-256-2665; www.thetwistedapron.com). But this isn’t just one restaurant – it’s three, three, three venues in one! There’s the restaurant proper under the above name, then there’s Bar West – that would be a regular bar to kick back and drink – and then The Chef Next Door, a space for private dining, cooking classes and cocktail parties. The restaurant has grown rapidly over its six years. It started as a café serving coffee, tea and small baked goods. A dinner and alcohol list were added, a wall taken down and booths were installed. Now the restaurant hums with about 100 seats. But let’s get back to the original name. “Twisted” has all to do with the way food is prepared. According to manager Lisa Cusmanic, the restaurant’s owner Kate Robinson wanted to take comfort foods – “things that you grew up with, whether it be by your grandmother, mother or whoever was the best cook in your house” – and have her chefs put “a twist” on them. The Twisted Burger is Ontario free-range beef, brie cheese, truffle aioli, crispy fried onions, lettuce, tomato, brioche bun. The Beef Dip is roast beef, horseradish aioli, sauteed onions, baguette, au jus. And the Truffled Grilled Cheese is aged white cheddar, brie, caramelized onion jam, brioche. You get the idea. There are several salads including a Grain Bowl featuring mixed grains, roasted mushrooms, summer squash, red onion, crispy chickpeas, baby kale, cider vinaigrette. The restaurant is noted for its full breakfast line, served until 5 pm. There are two daily homemade soups, and specials like Philly Cheesesteak served in a bread bowl with provolone cheese, which WON.com ordered. It was good and hardy but we'd have liked it a little more flavorful. Cusmanic said the clientele, like the restaurant’s décor featuring nifty chandeliers and even stuffed animal heads, is eclectic. That includes neighborhood regulars, law school students, and people who just like to dine out and have The Twisted Apron as one of their mainstays. Also different is the resto’s wine on tap and cold brewed (not iced) coffee, a Windsor area product. And the restaurant does take out. “We have environmentally friendly takeout boxes,” Cusmanic said. The Topical Hut (618 Goyeau St., 519-915-9602; on facebook) Philippine Cuisine restaurant started as a take-out restaurant in 2003 at Ottawa St. and Kildare Rd. After some time owner Leny Inting closed it for health reasons and, later, seeing the potential for a wider market, reopened in 2013 as a full sit down restaurant downtown in what used to be a small office building at the corner of Wyandotte St. across from the Windsor-Detroit tunnel. While attracting Windsorites the restaurant has a sizable American clientele. During our visit, one couple from Michigan – unfamiliar with our credit card PIN machines! – was paying as we sat down. The owner was also prepping for a party of a couple of dozen people coming over from the US. “I have lots of American customers just across the border, who come to eat here when they want to relax,” Inting said. Why such interest by US customers? “There are a few (Filipino) restaurants in the Detroit area but they are just basically take out - there are just one or two tables - but really not a dining room like mine,” she says. The Philippine islands’ cuisine is a melange of influences, from China, Malaysia, India in the subcontinent, as well as from colonizers like Spain and Italy. Our dish this night was Menudo - pork stew combined with vegetables and spices ($9.99), which seemed more Indian than anything else, with its heap of meat and few vegetables – the prefect protein stick-to-your-ribs dish for a winter night. Inting said another popular dish is Chicken Adobo - chicken thighs cooked in vinegar, soy sauce and spices ($7.99). Philippine cuisine is big on pork and some of the pork dishes are quite exotic, like Sisig - chopped boiled and grilled pork ears and belly, cooked with chicken liver and spices ($11.99). Otherwise you’ll find variations on noodle dishes like Palabok - noodles mixed with ground pork and seafood sauce, topped with smoked fish, pork rind, boiled eggs and roasted garlic ($8.99). Some dishes seem quite Western, like Bistik - lemon flavored beef strips topped with onion rings. And there are grilled back ribs and chicken wings. Inting, already enjoying a strong clientele based on word of mouth, still wants to get the word out about this largely unknown, at least to most locals, cuisine. “I’m trying to introduce our food to non-Filipinos,” she says. Toast Breakfast & Lunch (653 Erie St. E., 519-915-1023), five months old, occupies the space formerly of the long time La Casalinga. The decorative front door vines and even the wine bottles still affix the walls. Toast is one of a growing number of breakfast and lunch places, serving all day breakfasts for a city that can’t get enough of the traditional morning meal. On a Wednesday at 11 am the resto was more than half-filled. Despite 7 am - 3 pm daily hours most diners show up for breakfast, not lunch, said a waitress. It’s no wonder why. Despite the city’s appetite for basic bacon and eggs this restaurant makes a point of serving fancier items, like smores waffles, fruit crapes and cinnamon crunch French toast. There are breakfast skillets, with food still simmering in iron skillets. The Western at $8.99, for example, had a couple of eggs (your choice the style) atop a mixture of diced ham, onion, peppers, laced with melted cheese and house potatoes. It was probably enough for two people. The menu also has 10 omelettes including chicken and turkey. One of the most popular dishes is the California Benedict with avocado, bacon and tomato. The Western was tasty though it could have used a few less potatoes. The accompanying plate of whole wheat toast was the plainest type of bread. Meanwhile, if anyone’s interested, the lunch menu features a vast array of salads from Greek to Toscado (served with salsa, guac and sour cream) and lemon herb salmon. There are sandwiches, burgers (including one with avocado, bacon and bleu cheese), Ciabatta sandwiches, wraps and even sandwich pitas. The family – including the wait staff - who owns and operates Toast, obviously have thought out a menu that offers the traditional breakfast for the non-adventurous but kicks it up several times for those who like to experiment and indulge. Bravo. This can be a bit confusing as there are three Michigan Diners, two owned by the same owner (Tecumseh Rd. E. and Howard Ave.) and a separate one on Manning Rd. in Tecumseh. This review is about the Michigan Diner located on Tecumseh Rd. E. in Windsor (7435 Tecumseh Rd. 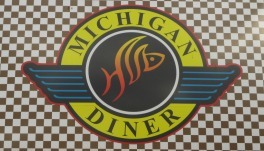 E., 519-944-5111; www.michigandinerwindsor.com) If Cheers was a place where everybody knew you name this throwback to a diner of an earlier era is a place where everyone, in friendly fashion, might want to know it. The staff are extremely friendly and so are the customers. It’s about as down-homey as you can get in Windsor. In fact, it seems odd not to talk to your fellow diners. “He (Trump) has no idea how to run a country,” says Lyndsy, an opinionated regular who is about to dig into her halibut fish and chips at the next table. Then there are the waitresses, folks like Sarah and Sonja. “If it’s a complaint it’s Sarah, if it’s a compliment it’s Sonja,” jokes Sonja. Both waitresses good-naturedly check on how the customer is doing. As you’d expect by the name, the Michigan Diner is all about local nostalgia. There are big photographs on the walls of places like the old Hi Ho fast food drive-in chain, the Skyway outdoor theatre, the Volcano pizzeria. The decorations are definitely of Canada’s motor city, with a large automobile grill sticking out from the wall. The busiest time of the day is between 3 and 6 pm. That’s when the seniors’ discounted menu is served. “And they get a lot of food,” says Sonja. “People come every day, you really get attached to them.” Meanwhile the restaurant’s favorites are broasted chicken, stuffed sandwiches and especially the Blue Plates, everything from cheddar bacon dogs to Mom’s meatloaf. There’s also ribs, seafood and salads. (The restaurant is not licenced.) Our order was the triple decker turkey club, with all ingredients fresh, the accompanying cole slaw not creamy but with not too much vinegar either, just fresh and light. Dine at this restaurant a few times and you’ll get to know everybody pretty quickly – customers and staff. Billys Taphouse (305 Talbot St. N., 519-776-7094; www.billystaphouse.com) is a reason to drive out of your way and visit the county seat of Essex. Of course, if you live in Essex you already know the charms of this eatery. Besides its ambience, it distinguishes itself by being one of the best restaurants in Windsor-Essex to give a huge shout out to locally-sourced food and beverages. A major makeover last January saw completely new finishes featuring a dark interior, with tall deep-cushioned booths, and a long bar stocked smartly with Essex County wines. Meanwhile the interior design is what could be called contemporary cool: open ceiling duct work, a huge chalkboard listing tap beers, and Edison style lightbulbs hanging from the ceiling. For locavores, the menu is a treat. Produce is sourced from Kingsville’s Northern Seedlings, buns from Leamington’s Lakeshore Bakery. Other suppliers are 4D Butcher (North Ridge), Belwood Farm (Amherstburg), Bradley Farm (Cottam), Ewe Dell Farm (Woodslee) and Essex’s own Schinkel Butcher. The restaurant even has its own produce garden. In general, you’ll find on the menu scrumptious salads like the Apple Spinach, with caramelized apples, baby spinach, grilled chicken breast, dried cranberries, goat cheese, bacon, black sesame seeds, and apple cider dressing ($15). There’s also a Charcuterie Board with local butchers’ cured meats, cheeses, roasted peppers, candied pecans, quartered egg, toasted baguettes, and honey Dijon dressing ($25). There are several gourmet burgers. And on the main menu there’s Iron Pot Pie with pulled turkey breast, carrot, peas, corn, sage gravy, herb puff pastry, and garden salad ($15). There’s Bangers & Mash Pot Pie with sausage, mushrooms, onion, beef gravy, and garden salad ($15). We ordered the Taphouse Chicken Sandwich with caramelized apples, bacon, grilled chicken breast, Swiss, spinach, and barbeque chipotle dressing ($14). The food was sweetly delicious though the chicken was somewhat dry and since this was a sandwich we expected it to be served on multigrain bread – like other dishes there - not white hamburger buns. But this is a minor criticism given the restaurant’s overall appealing menu and great vibes. We’d long wanted to set foot in Smoke & Spice Southern Barbecue (7470 Tecumseh Rd. E., 519-252-4999; www.smokenspice.com) and missed the opportunity when it was located on Ottawa Street (now home of one of Mamo Burger Bar’s two locations, owned by the same folks). But it moved to its current location, the former spacious Montana’s BBQ & Bar on Windsor's far east side, five years ago. Wow, does time fly! People have raved about the resto's southern style cooking, directly learned by owner and chef Ryan Odette during a culinary career in the southern US. And he and wife, Tina Odette, also toured BBQ eateries across Tennessee, learning the fine art of slow-cooked meat. They've obviously been able to pull it off (literally) and for several years now. On our visit, our menu choices were the Peckin’ Pig – pulled pork served with one smoked chicken breast ($16.95), and the Pulled Pork Sundae – pulled pork, BBQ beans, coleslaw and the Original (house made) sauce, with cornbread ($10.95). First, the cornbread was wonderful – light, slightly moist, almost cake-like. The chicken breast, often dry in other restaurants, was moist and tasty. Overall the Peckin’ Pig dish provided a generous serving. The Sundae was smaller, as advertised, with the coleslaw mimicking the “ice cream” on top. Meanwhile, also on the table, there were four accompanying house sauces – also sold separately in bottles to take home – with our favourites being the Original sauce and Memphis Sweet sauce. The restaurant serves a lot of what you’d expect at a down home BBQ joint – ribs, wings, southern fried fish, smokehouse chili, sweet potato fries, mac & cheese, and collard greens. But the owners are savvy enough to give a nod to today’s eating culture. So you’ll even find several gluten-reduced main and side dishes, and even vegetarian plates like fried pickle spears and goat cheese salad. Y'all come back now! Sundried Tomato Bistro Italian Cookhouse (122 Chatham St. W., 519-258-2000; on Facebook) almost stands as a last survivor among what used to be downtown’s restaurant row. Closed across the street are the Chatham Street Grill (formerly L’Auberge de la Bastille) and the Beer Market (formerly Cadillac Jack’s) and down the block The Pour House Pub (formerly Ye Olde Steak House), among others. Sundried Tomato, owned by Kim Vangeloff, used to be The Pitt for Pasta. It’s a spacious venue with exposed brick and contemporary ambience giving a nod to Windsor’s past, with large photographs of local streets in their heydays and iconic old buildings. Booths line one wall, open tables – including those for groups – line the middle and opposite side. There’s a Cheers-like bar at the front. On this weekday late afternoon, a crowd of 20 American tourists, in Windsor for a wedding, had just left after a meal. Out of towners – often from nearby hotels - make up a large portion of the restaurant’s customers, the friendly waitress said. Sundried Tomato offers lunch (most sandwiches are $9 and basic pasta dishes run below $10) and dinner options, with the latter having pastas for prices mostly in the high teens. Tonight’s lasagna special was priced at $16.95. It came straight in its boat dish piping hot from the oven. Unlike most restaurants, where the lasagna tends to be very meaty and oily, Sundried Tomato’s lasagna had a very fresh tomato taste. The sauce is made from scratch with fresh tomatoes. Also, the accompanying Caesar salad was noticeably different from most restaurant Caesars in that the leaves were chopped finely, big tough spiny lettuce leaves being a pet peeve of ours. Otherwise the menu features chicken, veal, seafood, steaks and chef’s choices such as Veal & Mushroom, Famous Chicken – breaded chicken topped with roasted peppers, mushrooms, sundried tomatoes in white cream sauce with melted mozzarella cheese – and Walnut Chicken. Panache Ultra Lounge (53 Pitt St E., 519-962-5233; www.panachewindsor.com) has been in existence six years, a little swath of hip elegance in the city’s deep core. The vibe of this smallish resto and bar is black and white lux, from the filigreed wallpaper to the classic large chandeliers and deep cushioned black seated booths. Panache serves food until 11 pm but as evening rolls on quickly turns into a bar with scheduled DJ-inspired music. (Panache’s hours are 4 pm – 2 am, seven days.) The decor includes framed prints of icons of a familiar sort – Audrey Hepburn, Marilyn Monroe. The music – edgy AAA – this day was slightly loud for a quiet late afternoon. The food menu’s emphasis is on steak such as NY Steak 12oz pan seared garlic butter basted, Petit Filet 6oz Angus prime hand cut steak and Filet 8oz Angus prime hand cut steak. Otherwise you’ll find a cross-section of the kind of meals that epitomizes the upscale trendy - Spinach and Mushroom Chicken (roasted chicken breast, spinach, mushrooms, green onions, pecans, and mozzarella cheese) or Grilled Browned Butter Honey Garlic Salmon (fresh baked, finished with a browned butter). There’s a large selection of similar styled appetizers - Buffalo Shrimp, Sweet Chicken Strips, Chicken Satay, Brie Cheese, Chorizo Flat Bread. The sandwiches are mainly upscale burgers. And, yes, there are attractive scrumptious salads. What’s the most popular dish? The friendly server says one of them is the Steak sandwich ($15). Okay, we’ll bite. Surprisingly the sandwich is served on a square wood cutting board. Accustomed to traditional tavern steak sandwiches – open on half a roll - it was surprising to see this steak is fully covered in a soft bun and cut in half. The meat is slathered in mozzarella cheese, sautéed mushrooms, onions, and BBQ sauce. The server said the difference between this steak sandwich and others was the use of tenderized steak so it wouldn’t pull as you chew. Well, it was still in parts chewy but was otherwise sweet and delicious. The pre-packaged - and pre-seasoned - stringy fries were surprisingly tasty. On the board there was also a small paper cup filled with ketchup. But the board was noticeable for its emptiness. There should have been something else - slaw or marinated vegetables – to have rounded out the meal. Jack’s Gastropub (31 Division St S., 519-733-6900; www.jacksgastropub.com) must be one of the most pleasant places to eat on a balmy sunny summer afternoon. The former old red brick house that dates from the 19th century has an outdoor patio off the main entrance as well as a wrap around verandah with dining tables. The interior is also attractive with a distinctive pub feel, and was cool and refreshingly breezy on yet another sweltering day of this hot hot summer. It’s astonishing that Jack’s has been around since 1989 though located at the Division Road address since 2001. We had high expectations of this restaurant because of word-of-mouth. And, from the look of most of the lunch meals – heavy on the burgers and Jack’s signature slaw – the dishes looked unique and delicious. But our order of Pinot Grigio called for fish so we settled for middle-of-the-road perch and chips. The server could have been faster and she admittedly apologized. The water and lemon wedge was served in a small mason jar. This is supposed to be quaint but, really, it’s kind of hard to drink out of this type of drinkware. The white wine list – though admirably locally-sourced – had only six listings and because of this small number only three wines were dry. A six-ounce glass of Pinot Grigio cost $7.50, a 10 oz. glass 12.50 - that's rather pricey. The “panko encrusted” perch had a tough crust. The accompanying Jack’s Slaw was essentially red cabbage, bits of carrot and vinegar but was still sweet and generally tasty. The "caper-chili aioli" was the tartar sauce. The “fresh cut Bradley fries” were not particularly special. Otherwise, in terms of services, the restaurant had only one (unisex) restroom on the main floor though it was clean and well-appointed. There’s no greater evidence that Essex County’s wine industry is maturing than seeing the wineries’ increasing dining offerings. Whereas before the industry primarily featured small buildings and tasting rooms more local vineyards now are offering substantial culinary additions. Such is the case with Oxley Estate Winery (533 County Road 50, www.oxleyestatewinery.com). The winery, which opened in 2010, offers both a lunch and dinner menu and features the delightful Wine Garden, accessed through The Barn, a 1920s-era barn converted into a clean and bright sales and tasting room, dining room, kitchen and lounge. On a sultry summer day the lunch crowd filled about half the garden, a patio covered with tent awnings. The surrounding elements – including natural foliage, a trellis framed by old barn beams and a wood burning fireplace with bricks from the Jack Miner Bird Sanctuary, makes for a great place to while away an hour or two. The lunch menu, updated weekly with meals by “Chef Aaron,” featured nine dishes. These included the Sticky Pickled Duck Wings, The Barn Burger with red onion jam (a popular dish), a Jack Lettuce Wrap brisket including pickled apples, and a Charcuterie Plate. The Quiche with Mixed Greens was sold out. We opted for the Lake Erie Yellow Perch ($19). It was pretty standard fare - yellow lake perch with panko coating, tartar sauce, house coleslaw, and hand cut frites – and we weren’t expecting much different given only so much can apparently be done with this dish. So long as it was good. And it generally was. The fish was fresh, the fries thin and cooked properly, the tartar had a noticeable dill taste. The wines? There were only two reds and four whites, a bit disappointing, but that, alas, is the winery’s products. (There was also a nice selection of beers and cocktails.) The 2015 Chardonnay, advertised for its citrus taste, had such fruity quality one wondered if another wine had been poured by mistake. No, said the server, this indeed was the Chardonnay; he knew because he poured it himself. The winery not only offers lunch and dinner but hosts events and features live music Sundays. Indian food has got to be one of the best cuisines. It combines a combination of sweet and savory flavours with heartiness and healthiness – tons of meat protein and valued veggies like tomatoes and lentils and often swathed in yogurt and tantalizing spices. Even eating a lot of it isn’t prone to bring on diet guilt complexes. Which brings us to one of Windsor’s best known Indian eateries, the taste of India Tandoori Restaurant (1457 University Ave. W., 519-253-1414). The restaurant moved a couple of years ago from its long time (20 year) fixture at Wyandotte and Goyeau. Owners Mokees and Fatema Ahmed decided it wasn’t worth staying at that busy intersection because, well, parking had become just too difficult. The city had also closed one of its nearby parking lots, adding insult to injury. So the couple sold that building and bought a former Chinese restaurant on the more serene – with lots of ease of access and parking – University Avenue West. (Critics of University Avenue as an urban planning abomination take note.) “Business is excellent, I’m very happy here,” Mokees said on a quiet late afternoon. The restaurant touts its tandoor clay oven and also boasts of a lunch buffet ($9.99) that features two chicken dishes, three vegetable dishes, a couple of appetizers, rice, nan bread, dessert and, alas, a Canadian salad. Our dinner order was a nice spicy Vindaloo lamb curry (14.95) with extra chili, tomatoes puree and spices. We did opt for two carbs (naughty naughty, but good!) rice and fresh oven warmed nan. (Dishes come with either nan or rice.) No surprise, the Vindaloo was dreamy. The taste of India is spacious with seating on both sides of a divider. It has dark brown colours and some wall art but one wishes its interior had a bit of an aesthetic upgrade; the space is a little too basic functional. The piped-in music was what might be called middle of the road Indian. But what’s essential is the cuisine and Taste of India is still delivering the goods. The Bistro at the River was one of the best things the City of Windsor could have approved for the waterfront. Yes, we all know how wonderful the city’s continual “linear” park system is and of course have long applauded municipal leaders over the decades for creating this unique city view and public place. But, as we also know, that park system was, shall we say, a tad sterile. How about providing some other people-type activities – of the consumable food and beverage kind? So Bistro at the River was born almost a decade ago. We’d been to the resto under the former operator but not the newest one. On a hot June mid-afternoon several patio tables had patrons but no one was in the restaurant itself. Won.com chose the inside not only to get out of the heat but to get a closer view of the restaurant’s staff working and overall operation. Unfortunately, none of the entrees or pastas were available prior to 5 pm. So we settled on two seemingly unique appetizers – the Eggplant Tower ($9) – “Golden fried eggplant, basil, bocconcini, roasted red peppers, baby spinach & honey balsamic dressing” and the Grilled Baked Shrimp & Cheese ($12) – “Shrimp sautéed in garlic butter, cilantro and herbs baked with mozzarella and garlic toast.” The service was polite and relatively fast. Both dishes came at once and their presentations – especially the eggplant – were nice. The problem was the eggplant itself. For a dish that looked so scrumptious – and otherwise was – the eggplant was, well, eggplant – one of the blandest foods this side of mushrooms. The kitchen could have spiced this up or otherwise infused something tasty in the moribund slabs. As for the Grilled Baked Shrimp & Cheese, it was overpriced. The shrimps were of the smaller grocery discount packaged variety. The “artisan” (as the server described it) sliced toasted bread was great but there was way too much sauce for even the four large pieces to sop up. Bigger shrimp and some other food item, with perhaps less sauce (though it was delicious) could have improved the dish. Otherwise the restaurant’s ambience – including skylight – was fine and these culinary criticisms certainly don’t mean to detract from the overall venue, which is a great location and deserves continual patronage. On a street that is in transition the opening several months ago of Snackbar-B-Q brings a certain stability to a downtown block and says “we’re here to stay.” After all, the Kilt and Fiddle Irish Pub across the street has closed, and what was supposed to be a spanking new health centre beside it remains vacant. Snackbar-B-Q is associated with well-known restaurateur Mark Boscariol, who for at least two decades has been perhaps the leading figure in innovative restaurant concepts in Windsor. There was Chanoso's and Oishii, of course, and there’s now The Willistead. Here in the deep downtown the Snackbar-B-Q fills a niche by being both bar and restaurant – it seems neither one or the other, eschewing stereotypes. The indoor space is long with counter seating around the front windows, then some tables, then a bar, followed by tables in the back. The atmosphere has a definitive hip vibe. It’s also highly personal if the man behind the counter is any indication. Paul, the bartender and server, called a hearty hello and suggested sitting anywhere though, he added, the most interesting people were at the bar (on this quiet early evening the only people there were at the bar). Among them were a couple of lawyers from around the corner in Windsor’s court district. This joint is most definitely a barbecue. But, hey, this is 2016, folks, which means inclusivity. So vegetarians – you are welcome! Chef Jim Renaud serves up fare like Smashed Avacado Toast , Buffalo Cauliflower Wings (creamy slaw, buffalo style hot sauce and blue cheese crumbles) and Friend Green Tomatoes. A fellow diner was delightfully swooning over the tomatoes’ taste. Our order was Pulled Pork, enticed in part by the creamy buttermilk slaw and smoked white cheddar. Glazed Brussel Sprouts with Smoked Bacon was a side. The sprouts, interestingly, were smashed up, not served whole. The Pulled Pork was advertised as two-handed but the actual serving size was a bit disappointingly small though the food tasty enough. The Snackbar-B-Q is the kind of place to keep coming back to, to try out intriguing offerings, like the Porknado Burger and Pauly D’s (fresh ground Canadian angus, pulled pork, American cheddar, kc sauce, peppered bacon and crushed pork rinds). The “Smoker” serves Smoked Tofu, St. Louis Ribs and Smoked Petite Beef Tenderloin. There are 10 Ontario crafter beers on tap and the resto sources area wines. Among Windsor’s many and varied culinary delights it was doubly surprising to see that the city has an authentic Uyghur restaurant. Uyghurs (WEE-gurs) are form northwestern China, are Muslim, and share borders with counties like Russia, Mongolia and Afghanistan. The cuisine shares a few similarities with Chinese cooking but there are many differences. So we thought we’d certainly give it a try. Dolan (named for an ancient Uyghur village) Handmade Uyghur Cuisine (225 Wyandotte St. W., #103, 519-997-9850; on Facebook) is located downstairs in the Bhullar Plaza. There are just 12 dishes on the menu and all looked sumptuous from the poster in the outside window. Surprisingly, for Asian cuisine, the restaurant even featured a meat pie, and it also serves naan bread. Other dishes, such as Lahman, Cold Noodle, and dumplings, looked Chinese. But the cooking is Halal. The restaurant is big on serving kabobs and a table with two young Asians at it was served a platter of what looked delectable spiced skewered meat. Our first choice for dinner was Polov, rice with carrots and lamb or beef. But the restaurant was out of that. Asked what one of the most popular dishes was, we were told Big Plate Spicy Chicken. It looked yummy. So, okay. Son and mother (Adil Hamit and Guli Abliz), staffing the restaurant, were warm and friendly. The dish came with an appetizer of delicious cole slaw – not too vinegary not too creamy and decidedly different, especially compared to a lot of the stuff served in typical Canadian restaurants. Then the entrée arrived. It looked good. Enjoy, Guli, said. The dish was a potpourri of home made flat narrow noodles, red chili peppers and cut boiled potatoes. Said the Toronto Star, of all papers, in a review of the restaurant two years ago, the dish swims in a “dark pool of soy-flavoured broth with hints of star anise, brown cardamom and cinnamon. There is a goodly amount of garlic and ginger.” Here we see “the Western” influences in Uyghur cooking – i.e., boiled potatoes. We started eating. The dish was fine as it went. Then we started biting into the chicken. These were small nubs of chicken, perhaps 20 or 30 pieces, but all had bones inside of them. There was hardly any meat, especially after removing the skin on some pieces. After about 10 attempts to eat these chicken cubes – including spitting out numerous bones - it was time to give up. The meal was tasting worse and worse. Why, for heaven’s sake, could the restaurant not have used boneless chicken? Then, the bill, an incredible $21! Mexicantown to have Detroit's first "shared street"